It is no secret that Minnesota’s 5th Congressional District has one of the largest Democratic partisan tilts in the Midwest, so when state Representative Ilhan Omar won the DFL primary last August the question was not whether she would win the general election but how much support would she receive. In the end, Omar won 78.0 percent of the vote – besting GOP nominee Jennifer Zielinski by 56.3 points. Omar’s performance ranks third on the all-time list for newly elected members of the U.S. House of Representatives from Minnesota, although each of the two names ahead of her did not face another major party nominee. The state record is currently held by 1908 Republican nominee Clarence Miller. Miller was an attorney and state representative from Duluth who first defeated three-term GOPer James Bede for his party’s nomination to the 8th CD. Democrats did not field a nominee that cycle so the only candidate Miller faced in November was Public Ownership nominee Alexander Halliday. Miller won 81.6 percent of the vote – a record that has stood for newly-elected members to the chamber from Minnesota ever since. The congressman served five terms before losing the Election of 1918 to Union Labor nominee William Carss. The only other U.S. House candidate to garner a larger share of the vote for their first term than Omar was Republican Andrew Volstead in 1902. Volstead was the mayor of Granite Falls when he defeated two third-party candidates in the 7th CD general election with 78.6 percent: People’s nominee August Forsberg (20.4 percent) and Prohibitionist Knut Johnson (1.1 percent). The Republican lawmaker served 10 terms until he was soundly defeated by independent Ole Kvale in 1922. Other than Miller, Volstead, and Omar, only one other U.S. House nominee from Minnesota garnered more than 70 percent en route to their first term in the chamber. Farmer-Laborite Paul Kvale won 73.2 percent against Republican J.C. Morrison in the October 1929 special election to fill the vacancy caused by the death of his aforementioned father Ole. Of the 130 Minnesotans elected to the U.S. House (excluding 11 members elected alongside at least one other member to at-large seats on the same ticket), the average vote received for a newly elected U.S. Representative in the state is 53.2 percent. The lowest support was registered by People’s nominee Haldor Boen in 1892 with 35.6 percent. 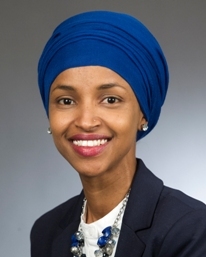 Omar also set the Minnesota record last week for the largest percentage of the vote received by a woman running for the U.S. House – besting DFLer Betty McCollum’s mark by 8.4 points. McCollum won 69.5 percent in her campaign for a fourth term representing her St. Paul-based 4th CD in 2006. For the first time in state history, the Gopher State will send three women to the House of Representatives for the 116th Congress: Democrats Omar, McCollum, and member-elect Angie Craig from the 2nd CD. 4 Comments on "Ilhan Omar Nearly Breaks Minnesota US House Electoral Record"
If I read the article correctly, SHE SHOULD BE REGARDED AS HOLDING THE RECORD FOR LARGEST PERCENTAGE OF THE VOTE IN A RACE WITH 2 MAJOR PARTIES (since Miller & Volstead had faced only 3rd-party candidates). Thanks sister that’s one of the greats history.